RUPERT, ID, February 1, 2012, Peggy Hess, Fourth-Grade Teacher for the Cassia County School District, has been recognized by Elite American Educators for dedication, achievements, and leadership in elementary instruction. Ms. Hess specializes in teaching science and mathematics, and she is currently responsible for educating between 25 and 35 students regularly. Inspired by a long-standing passion for helping young people to achieve their goals, she pursued a career path that would allow her to give children the opportunities to flourish academically. In her role, she supports the advancement of her students’ growth in a positive learning environment which embraces the belief that each child is unique. She feels that she has been able to accomplish her purpose to serve with determination as an educator because she has maintained a positive attitude over the course of a career that has spanned more than 30 years. Ms. Hess is passionate about learning, and her commitment to passing this fascination with learning has allowed her to help the students she works with to progress in their studies. She has also garnered a reputation of distinction for her peerless efforts in the field of education. She was honored with a Woman of Distinction Award, and she was named the Patriotic Teacher of the Year by the Veterans of Foreign War in 2010. Ms. Hess pinpoints the highlights of her career as earning her National Board certification and helping create and run a summer environmental science camp for teachers for six years. 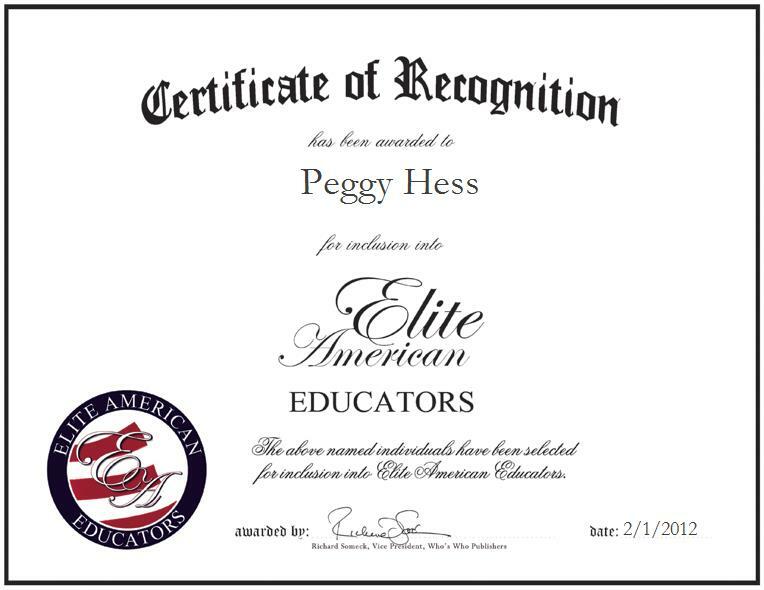 Peggy Hess was originally selected for inclusion in Elite American Educators in February, 2012. We are proud to be featuring Ms. Hess again in Elite American Educators for 2013/2014.